Sometimes you come across places that you instantaneously take a liking to and Neal’s Yard is one of these places for me. I love bright colours and this a small alley in the top corner of Covent Garden is full of brightly coloured buildings, windows, shop signs and decoration which give the place a happy and hippie feel. And, if you know a little about the man who created the Neal’s Yard concept, this hippie atmosphere is no coincidence. 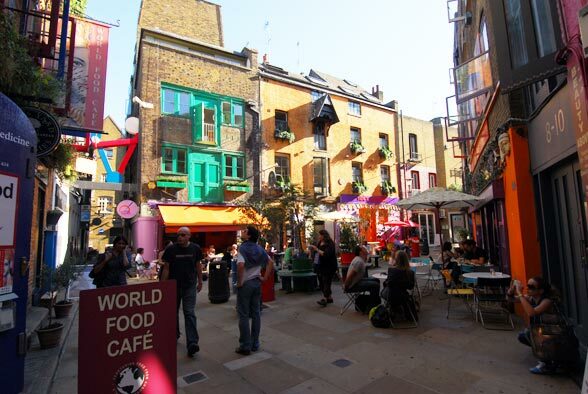 Neal’s Yard was the brainchild of the late Nicholas Saunders, a writer, businessman and pioneer of the wholefood movement. Saunders was always interested in the non-conventional lifestyle and alternative ideas and at one stage a flat that he had in west London became a centre for hippies and anyone with new alternative ideas. His 1970 book ‘Alternative London’ was a best-seller. When a friend inadvertently caused his flat to burn down whilst meditating in front of a candle, Saunders turned to a new interest. He knew of many skilled young people who wanted to work for themselves but didn’t have the financial resources to do so. He himself liked starting new ventures and enabling others to do so. He fell in love with a warehouse in Neal’s Yard and noting the new demand for wholefood, he started packing quantities of these and making them available at reasonable price. He gradually bought other buildings in the yard and helped to finance a cooperative bakery, dairy, flour mill, an apothecary and cafe. Saunders then went about improving the yard by planting trees in tubs, and decorating the buildings with window boxes flowing with flowers. He even imported white doves so that there would be birds fluttering about overhead. The yard would be full of office workers at lunchtime and tourists during fine weather. When Saunders sold the wholefood business in the mid-1980’s he turned his attention to alternative medicines. Realizing that many alternative medicine practitioners had nowhere to practice, he opened therapy rooms that they could hire. From alternative medicine, he went on to desk top publishing and other interests until an unfortunate car accident in South Africa took his life. When you visit Neal’s Yard today, Nicholas Saunders’ character and alternative interests can be seen in businesses such as Neal’s Yard Remedies which produces the popular Neal’s Yard cosmetics and other natural remedies and the World Food Cafe which advertises “exciting food from around the world” all prepared with fresh ingredients in front of your eyes. 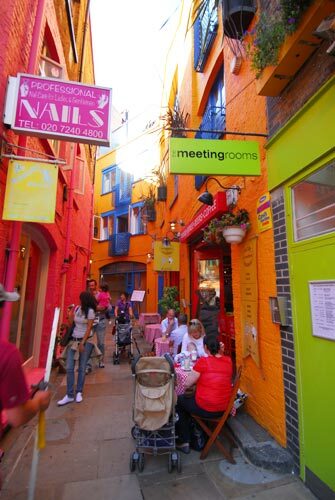 Neal’s Yard is in a neighbourhood that’s referred to as Seven Dials. This little corner of Covent Garden is a nice spot to enjoy a relaxing cup of coffee or lunch and a retreat from the hustle and bustle of London. Just around the corner in Shorts Gardens is Neal’s Yard Dairy, one of the best cheese shops in London.